Many individuals and athletes perform 1,000's of repetitive movements on a daily basis. These movements create imbalances in the body and can also result in fascial adhesions or scar tissue build up. 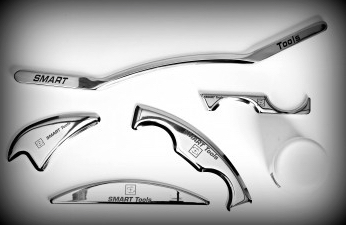 Instrument Assisted Soft Tissue mobilization is the process of utilizing specialized stainless steel tools to break up these fascial adhesions by hand. This treatment may be used solely by itself or in addition to a Chiropractic treatment program. Treatment sessions last between 20 - 30 minutes each. It is generally necessary to perform a series of 5-10 sessions to reach the maximal improvement. In some cases, 2-3 sessions may resolve the presenting complaint. The tools are sterilized and a moisturizing emollient is used on the skin to assist with the gliding of the instrument. There is some slight discomfort associated with the treatment which is the cost for breaking up chronic scar tissue and fascial adhesions. Many people describe this discomfort as tolerable and therapeutic. You will see a reddening of the skin which is the increased blood flow to the area and even some subcutaneous bleeding may occur which is fascial scar tissue being broken up.